In computer science, inter-process communication or interprocess communication (IPC) refers specifically to the mechanisms an operating system provides to allow the processes to manage shared data. Typically, applications can use IPC, categorized as clients and servers, where the client requests data and the server responds to client requests. Many applications are both clients and servers, as commonly seen in distributed computing. Methods for doing IPC are divided into categories which vary based on software requirements, such as performance and modularity requirements, and system circumstances, such as network bandwidth and latency. IPC is very important to the design process for microkernels and nanokernels. Microkernels reduce the number of functionalities provided by the kernel. 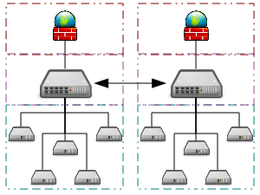 Those functionalities are then obtained by communicating with servers via IPC, increasing drastically the number of IPC compared to a regular monolithic kernel. Depending on the solution, an IPC mechanism may provide synchronization or leave it up to processes and threads to communicate amongst themselves (e.g. via shared memory). While synchronization will include some information (e.g. whether or not the lock is enabled, a count of processes waiting, etc.) it is not primarily an information-passing communication mechanism per se. Apple Computer's Apple events (previously known as Interapplication Communications (IAC)). ^ a b "Interprocess Communications". Microsoft. ^ "Windows/WSL Interop with AF_UNIX". Microsoft Corporation. Retrieved 25 May 2018.